Today, when you order "Make 'Em Laugh by Aldo Colombini - Book", you'll instantly be emailed a Penguin Magic gift certificate. You can spend it on anything you like at Penguin, just like cash. Just complete your order as normal, and within seconds you'll get an email with your gift certificate. 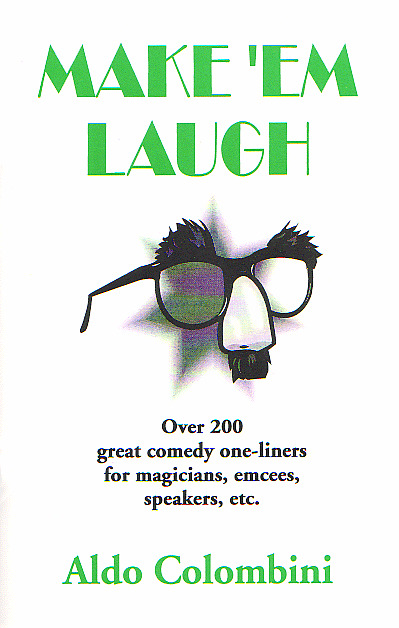 Make 'Em Laugh by Aldo Colombini - Book Over 200 great comedy one-liners for magicians, emcees, speakers, etc. Highly Recommended!!! If you're looking for some great one-liners to spice up any routine or just have in the back of your mind and ready for the right opportunity, look no further. Aldo Colombini has compiled over 200 comedy one-liners perfect for anyone who works in front of others. Even though I had read about the small size of this "book", I was still disappointed with it's thin size when it arrived. There are some funny lines in it, but many corny ones, and/or old lines that I used to read in joke books when I was a kid. I would definitely refer to this as more of a pamphlet than a book. It is thin, staple-bound, and the paper quality is poor. A few dollars less and this would be a good deal. Let's put it this way, Bobo's Modern Coin Magic is considered the Bible of coin technique, has priceless information, is 30 times thicker, has an actual glossy cover and is perfect-bound as opposed to stapled...and it costs less. I know it sounds like I hate this "book", but I don't. There are some funny lines, from what I hear, Aldo is a very funny man. I just wish the quality was better or the price was cheaper. If you like the style of Colombini and want to glean a few really good lines this is for you. If you use comedy in your magic this is a must have. Add to your cart you can not go wrong with this book of one liner's. Good! 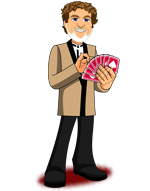 I think some gags can be used in magic, but many of them were just for other comedy routines. I got this book today and as I came home from school I saw a package from PenguinMagic on the dinnertable and in it was stuff I've ordered including this book, but I wouldn't say it's a book, booklet is a better word. It's not that small as I thought, almost the same size as the penguin catalouge or/and 125 Magic Tricks performed with a regular deck of cards, something in that size.